Did you know University Staff have Community Service Leave hours available to use? Here is the policy. All community service events listed below and on the OSLE website are open to students, staff, and faculty. Sign up for othe OSLE newsletter to receive weekly updates on opportunities, and check out our list below for upcoming events. We call our volunteers our “stars” because they truly are. 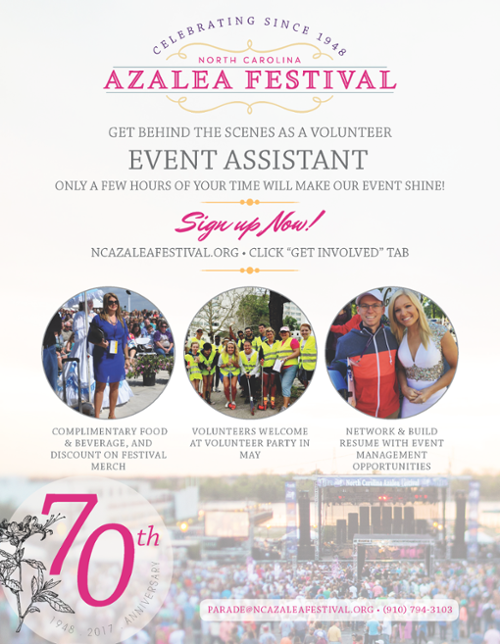 Our high level of hospitality would not be possible without our dedicated, tight-knit group of volunteers. 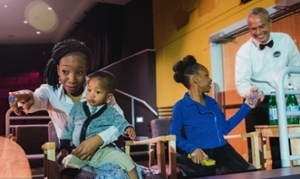 Volunteering can be your backstage pass to Broadway shows, concerts of all kinds, comedy and more. See the shows you want and save on tickets by helping us provide excellent guest service. 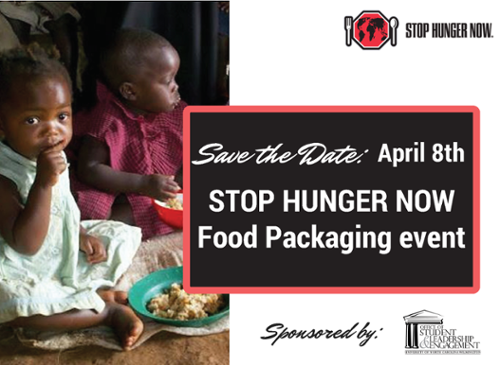 Stop Hunger Now is coming back to UNCW! Registration for the program will open February 20th. Save the Date to join us! Individual volunteers or small teams of friends can sign up for a Day of Hope and jump right into service. A rebuild is selected especially for the people who sign up. This is a great event for first timers and individuals who aren't part of a larger volunteer team. See the list below. If you are interested in participating, call or email our office. We will then send you the project location. We also have Mission Mondays, WARM Wednesdays, and Strike Team days that are held 8:30 am - 3:30 pm every week from mid-August through May. WARM provides tools & materials. A WARM construction crew member is on site with volunteers at all times. Purchase items to donate – look HERE for a list of what is needed – drop them off at the Academic Affairs Annex (trailer in the McNeill parking lot) or donate money to the relief efforts. Additional donation ideas include buckets full of cleaning supplies and backpacks full of school supplies. Offer to deliver supplies collected by the Center for Healthy Communities. Let Katelyn Matney (matneyk@uncw.edu) you are willing to help provide transportation to areas in need. Let Katelyn Matney (matneyk@uncw.edu) know about your location(s) so it can be advertised on the UNCW Hurricane Matthew Disaster Relief webpage. Let those affected personally know about the resources available to them. There are a number of ways to volunteer right now! The American Red Cross can locally connect you efforts happening near Wilmington. A good contact for local volunteer opportunities is Kelly Van Houten. She can be reached at (910) 315-8571 or at kelly.vanhouten@redcross.org. UNCW’s Office of Student Leadership and Engagement also plans to offer a weekend volunteer opportunity to affected areas in January 2017 – more information coming soon! The ReStore is more than just a thrift store! The ReStore allows Cape Fear Habitat to improve the standard of housing in our community. Every ReStore purchase supports the mission of Cape Fear Habitat by providing household and building supply items at below market cost while protecting the environment. Volunteer opportunities with this organization include sorting of donations, creating store displays, and clean ups. Email Leslie Hernandez to volunteer at our bi-weekly visit to the store, and click here to learn more about Habitat ReStore. Miracle League baseball is held throughout the Fall, Spring and Summer Seasons for hundreds of children and adults with physical, developmental, and intellectual disabilities aging from 4 years old to 64 years old. Since 2013, hundreds of children and adults with disabilities have played on the 33,000 square foot rubberized BRAX Stadium PPD Miracle Field located in Olsen Park here in Wilmington. Volunteers for Miracle League serve as buddies for players, work concessions, and can even serve as the Miracle League mascot! Interested in volunteering with us? Email Elizabeth Nelson. You can also learn more about the organization here. Spring Arbor is a Residential Assisted Living and Alzheimer's Dementia care facility for senior adults in Wilmington. OSLE works with the Spring Arbor staff to volunteer at resident activities like bingo, manicures, picnics, and outings in the community. To volunteer at the next Spring Arbor event, email Holly Wood. Click here to learn more about the facility and its programs. Cape Fear River Watch seeks to protect and improve the water quality of the Lower Cape Fear River Basin through education, advocacy, and action. To participate in our monthly clean ups, email Megan Marchant. You can find out more about CFRW here.